On Sunday, we said “arrivederci” to Lake Como. We headed to a hotel by the airport where we would stay the night and fly out the next morning. After checking in and dropping off our bags, we drove back into Milan for our last evening of vacation. You will all be happy to know that our last European dinner consisted of beer and sausages in the parking lot of San Siro soccer stadium followed by the AC Milan vs. Rome game. 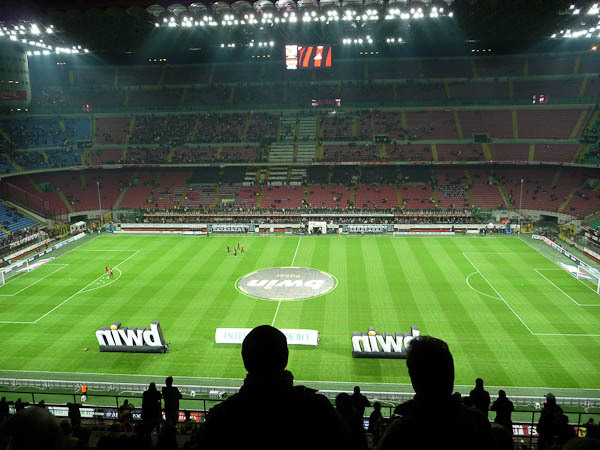 Unlike stadiums in the U.S., the Milan stadium does not have a bunch of concession stands inside. (The same goes for the stadium in Lisbon.) There are only a few stands, and the offerings are limited to soda, water, espresso and simple snacks like chips and crackers and candy. You can’t buy beer or hot dogs or other meal-food inside. This is why there are all sorts of food trucks in the parking lot on game days. People arrive early, grab a sausage and a beer, and then head into the stadium when they are done eating/drinking. 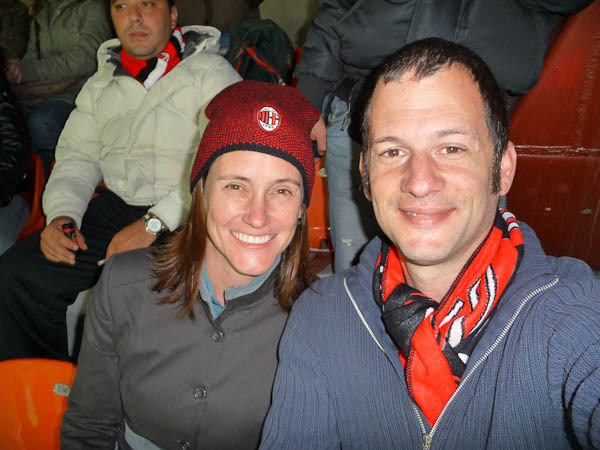 The soccer game was a lot of fun with a good rivalry between AC Milan and Rome. 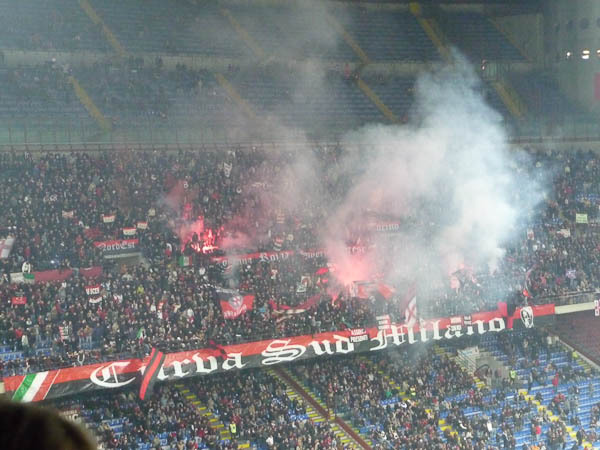 There was a whole section full of Rome fans at one end and an even larger section of die-hard AC Milan fans at the other, and they shouted, cheered, waved flags and sang songs throughout the game. 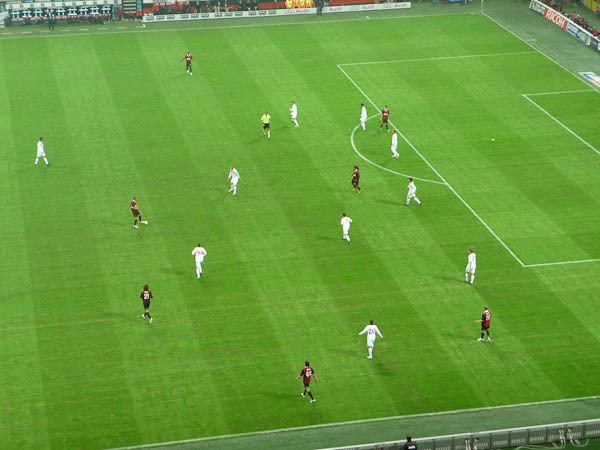 AC Milan has not been playing well this season, and they stunk for the first half. Rome scored in the first 3 minutes. The crowd was not shy about expressing its opinion about the team’s playing; let’s just say that the guy in front of us had really long middle fingers. When half-time came, the entire stadium boo’d the team off the field. The second half of the game was more interesting. We saw Ronaldinho score a goal on a penalty kick. (He’s a world-famous player from Brazil.) 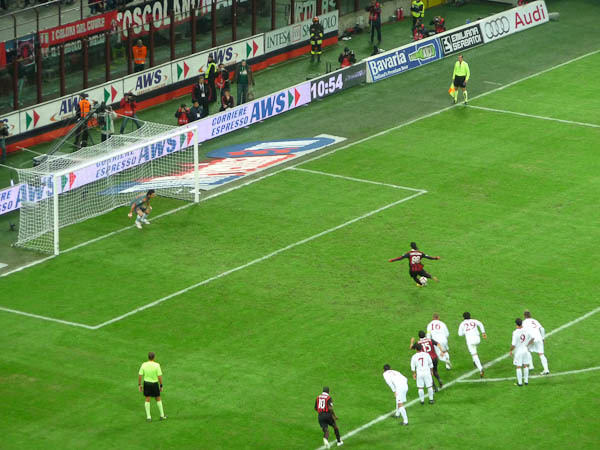 Then another AC Milan player named Pato scored a beautiful goal, and the crowd went absolutely crazy. AC Milan beat Rome 2-1. After the game, we drove back to our hotel and arrived at midnight. We got up the next morning at 6:30, had a hotel breakfast, and headed to the airport. Our plane left at 10:45 am, and we arrived in Atlanta at 3:10 pm after a 10-1/2 hour flight. 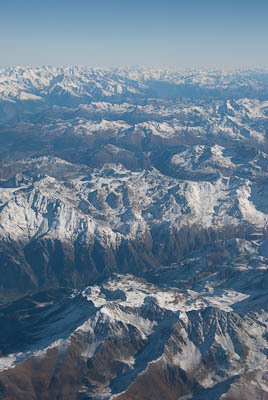 I am not afraid to admit that I cried a little on the way back to the States. We have had an awesome, amazing adventure for the last 7 months. We learned a lot - about ourselves, about each other, and about other cultures - and we met some great people. Would I change anything? Very little. Would I do it again? Absolutely! Stay tuned for a final post with our “best-of” recommendations. But give us a few days. Our bodies are here, but we’re still waiting for our hearts and minds to return from Europe. Welcome back Juli and Chad! I've enjoyed reading about your travels and am looking forward to your best-of posts. My, you do have the expressive speech. I feel nostalgic with you, but welcome home. 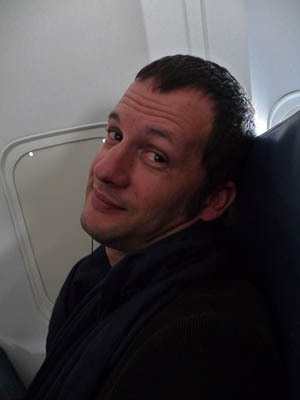 Now the culture shock of returm to the U.S. How long will THAT jet lag last? Glad your home cant wait to talk with you. missed you guys so much. What a wonderful adventure I've had reading your very interesting stories and looking at the pictures. Welcome home. Can't wait for some sort of a reunion to see you guys! Now if we can just get Mom and Dad and Uncle Jack on the east coast. . . .
All content coypright ©1994-2019 chad l. altemose except where noted.